A LOCAL PRISON FOR THE POOR. A STUDY OF THE KINGSTON HOUSE OF CORRECTION, 1762-1852. This is the first detailed study of a prison in Heathen Street, Kingston upon Thames, once in the ancient County of Surrey. It was known as the “House of Correction” by the bench of magistrates who were responsible for it, but was called the “Bridewell” by local people. 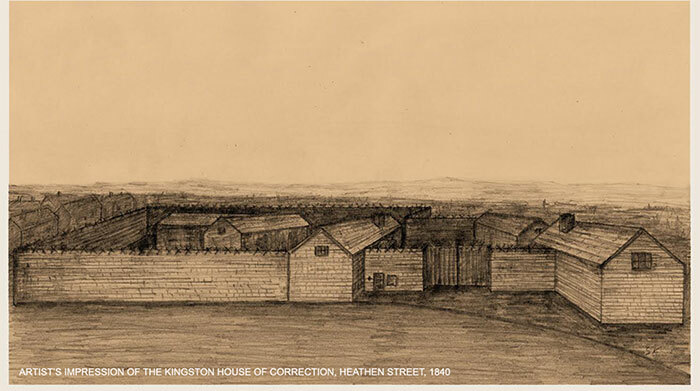 The study makes a contribution to the history of Kingston, includes an artist’s impression of the outside of the prison as it would have been in 1840, and adds to the history of local prisons in England. The prison was open by 1762 and closed in 1852. Originally intended to assist the return of apprehended vagrants to their home parishes, it was created at relatively low cost by joining-up with walls the buildings of a small estate in the town called “Wheelbarrow Court”. Later, it was extended by annexing an adjacent estate known as “The Chimney Sweeper’s House”. Although the first two governors were dismissed following misdeeds, later the prison’s management met the requirements of the Surrey justices, and generally satisfied the Prison Inspectors. In 1762, the only officer on the County’s payroll was the governor. By 1851, there were ten officers in post: a governor, a surgeon, a chaplain, a matron, a secretary and five turnkeys. Initially, the establishment held few prisoners, but between 1834 and 1851 there was roughly a four-fold increase in the numbers held annually. There were no facilities for hard labour and generally, the inmates were serving relatively short sentences for petty crimes. From about 1800, a part of the prison was used to detain felons when Quarter Sessions and Assizes were held in Kingston. The felons were held separately from the other prisoners being, until 1840, chained down to the floor at night. The Preamble of the Gaol Act, 1823, confirmed a requirement that a prison provided safe custody of prisoners, preserved their health and effected their reformation. While up to 1830 escapes from the prison occurred, nevertheless, overall it was a healthy place. But, the attempted reformation of convicts from 1837 onwards, mainly through the operation of the “silent system” that was designed to prevent “contamination” of novice criminals by habitual criminals, was by 1846 acknowledged to be a failure. This could not be attributed to bad management. Rather, at Kingston, even with good staff and sound buildings, but without a separate cell for each prisoner, it proved impossible to impose silence on the inmates. Concern about the prison’s costs and a proposal that it should be closed as a house of correction to save money were first voiced in 1825. It was impossible to dismiss the idea that local vested interests were at the root of opposition to, and delayed, its closure. The Kingston House of Correction stayed open until 1852 when the new Surrey House of Correction at Wandsworth, designed economically for operation of the “separate system” for the reformation of prisoners, was ready to receive prisoners.